Transcendence Theatre Company and Broadway Under The Stars co-founders Amy Miller and Stephan Stubbins will share inspiring stories about how far Transcendence has come in its eight years in Sonoma County, and give insights about what the company is planning this summer in regards to performances and outreach. In addition they will share exciting news about Transcendence’s first ever full musical in Jack London State Historic Park this summer, “A Chorus Line”. The talk will culminate with a song or two from Transcendence Broadway artists. Reflection: Karen Ball and Chip Rawson shared a rendition of that Old Irish classic Danny Boy in celebration of St. Patrick driving the Kiwanians out of Ireland. Nour and Chad are in the final stages of Rotary membership. Nour was in the house today. Tim Delaney was at Rotary today. He recently had a basil cell carcinoma and about an inch removed from his ear. Appears to be in good health and we all send our wishes and prayers that that will be that. Rich de Lambert announced there was $81 in the pot. The pot is still intact minus $10. A pirate walked into a bar and the bartender said: “Hey, I haven’t seen you in a while. What happened? You look terrible”. Pirate: What do you mean? I feel fine. Bartender: What about the wooden leg? You didn’t have that before. Pirate: Well, we were in a battle and I got hit with a cannon ball, but I’m fine now. Bartender: Well, okay. What about that hook? What happened to your hand? Pirate: We were in another battle. I boarded a ship and got in a sword fight. My hand was cut off. I got fitted with a hook. I’m fine really. Bartender: What about the eye patch? Pirate: Oh, one day we were at sea and a flock of birds flew overhead. I looked up and a bird sh– in my eye. Bartender: You’re kidding! You lost an eye just from bird sh– in your eye? Pirate: It was my first day with the hook. Ann Gospe warned that she will be hitting you up to volunteer at Giro Bello. Ray Giampaoli and Steve Baime asked for Rotarians to get sponsorships and do business with those sponsors. We have 15K so far. Remember that money goes to our committees and back into our community. Kim Graves asked that we get those flyers out to the bike shops and gyms! Pete Lescure needs fellowship volunteers. 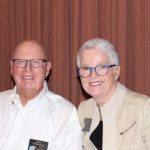 Elizabeth Karbousky and Rick Allen were serenaded with Rotarians singing Happy Birthday. President Tony shared the progress of Coffey Park and his being one of the jurors who will choose from 26 applications for the $110,000 art installation at Coffey Park. Elizabeth Karbousky was finally recognized for her Disneyland trip with her family back in January. She generously donated $100 to the club. Mike Fee is a President of the Board of Directors of Achon Uganda Children’s Fund, a small non-profit organization co-founded by Mike’s father Jim, and by Julius Achon, an Olympic runner from Uganda. 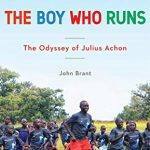 As a boy, Julius was abducted by Joseph Kony’s army and forced to fight as a boy soldier. 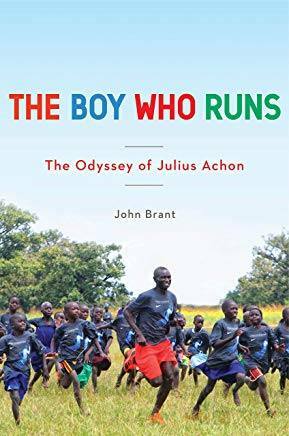 He escaped — literally ran away — and went on to become Uganda’s best runner in a generation, captaining two Olympic teams, and setting the NCAA record in the 800, having received a track scholarship to James Mason University. Today Julius serves as a member of Parliament in Uganda, representing his impoverished and war-torn home region. 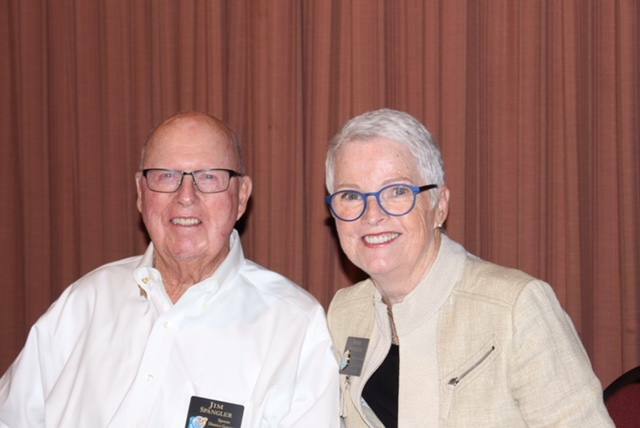 Mike spoke about his experience with AUCF, starting with his father’s friendship with Julius, the organization’s growth — thanks largely to support from different Rotary chapters — and the impact that it is having today, through its rural health clinic and microfinance program. He shared a video that showed his family and the medical center set up by the organization. After the meeting, Mike accepted donations for copies of the book and asked that Rotarians share the book with others so that more people can be aware of both Julius and the Achon Uganda Children’s Fund.